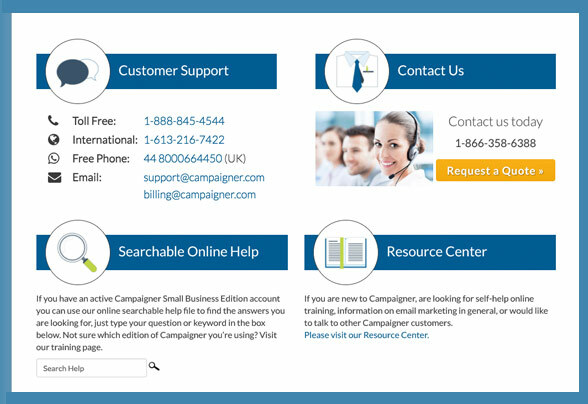 Campaigner is best suited for HTML-savvy email marketers working for an enterprise business. Campaigner offers a staggering amount of features, with everything from A/B testing to geolocation services via Google Maps. 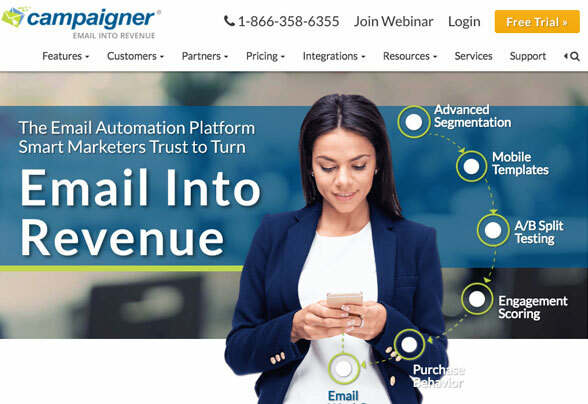 It’s a tank of a system, and if you’re a business with a diverse set of email marketing needs, then Campaigner has you covered. Its pricing isn’t very friendly, but it’s not overpriced for the services provided. It offers a suite of services for enterprise businesses and is definitely targeting large businesses. A few cool reporting features include the experiments function, which allows you to test a variety of emailing variables, and the multitiered emailing editor. Depending on your expertise, you can build an email from the ground up using the bare-bones templates or choose a predesigned but more restrictive template. Campaigner also offers an impressive amount of white papers, materials on email marketing and video tutorials, so you’ll have no problem exploring the tool and learning how to become a savvy email marketer on your own. Campaigner capitalizes on a bunch of features that most email marketing services don’t offer, such as geolocation via Google Maps so you can easily set your desired audience via radius targeting, purchase behavior targeting, real-time ads and engagement scoring. These features are most useful to large businesses, but medium-sized businesses can benefit from them as well. Perhaps the most impressive feature is the set of over 900+ templates. It seems to have templates for every business, event and industry imaginable and tends to add more when it sees a need develop. Combine the multitude of features with 24/7 customer support and a suite of resources for you to dig into, and Campaigner definitely makes it clear how it’s managed to stay competitive since 1999. Campaigner offers over 900 templates. It’s almost easy to become paralyzed by the sheer amount of choice. All of the templates are mobile-responsive, but the designs on a surface level look antiquated and don’t match up to competitors such as Mailchimp and FreshMail. You can customize these templates without HTML knowledge, but it will be tough to get them looking modern without some HTML expertise. Campaigner doesn’t hide the fact that it is aiming for larger businesses, with the recommended packages starting in the $150/month range. The feature set is competitive, but it also restricts a lot of features until you’re paying for one of the upper-level tiers. Perhaps the most alarming element of the pricing structure is the requirement for a credit card before you can sign up for a free trial. Once you sign up, you must go through a customer service representative to cancel your subscription. This is a mark of insecurity, and I found it to be exasperating as a consumer. That being said, the prices are competitive for the features it offers, and while I don’t agree with the methods, it’s clear Campaigner has a loyal customer base of businesses and has done quite well for itself. Campaigner, as a whole, feels like a late ‘90s, early 2000s email marketing platform. In other words, it doesn’t have the sleek feel many of its more agile competitors such as Mailchimp, FreshMail or ConstantContact have. While the templates are impressive in scope, in can be difficult to decide on one since you have so many options. The email editor also feels old, and you can either choose between a smart email builder that is more like your traditional drag-and-drop editor or a more ground-up HTML-based editor. The smart email builder is easy to use, but that ease of use cuts into your ability to be creative and make edits within the email. If you want a high level of customization, you’re going to need some HTML experience. The dashboard is laid out well, and you can easily see your recent campaign stats and overall list growth metrics. This makes it simple to hop in and get an idea of exactly what your email marketing efforts are doing. As far as you want to take email marketing, Campaigner has a built-in feature ready to accompany you. The geolocation targeting, in particular, is really useful, and when you combine that with autoresponders, you can develop some powerful automation systems such as sending via location-based promotional campaigns. The tool makes it easy to set up these systems, but it’s difficult to get the platform to present your business in a modern fashion. The entire tool is outdated, and it desperately needs a rebrand! I really like the dynamic RSS feature. If you’re a blogger or run a company that blogs on a variety of different topics, this can be a really powerful feature. The automatic suppression and unsubscribe capabilities come in handy with large lists too. Lastly, the engagement scoring (a.k.a. lead scoring) is great for companies that want to reward customers who engage the most and make sure their sales team is personally communicating with their most engaged users. Campaigner’s customer support is 24/7 and has won numerous awards for its response rates and friendliness. It also offers phone and email support and a variety of educational materials to help you learn the platform and how to become a professional email marketer. Materials from the resource center include top tips on increasing email rates, white papers on designing mobile emails, video tutorials of purchase behaviors, infographics on best practices for A/B testing, webinars on Campaigner email marketing, case studies, data sheets on experiments, API User Guides, and one-sheets for explaining concepts to your team — and that’s just scratching the surface! It is also very active on socials and consistently puts out pieces of content on Twitter and Facebook. It usually posts a few times a day on both platforms, so subscribe to those feeds to get even more helpful content for your business. Some people claim Campaigner’s support can be a pit pushy on the sales side — seeming to operate on a more traditional “squeeze” quota model, but I’ve only had positive experiences with the staff. Campaigner offers a bevy of email marketing tools that cover anything and everything your business needs on the email marketing side of things. Features include 900+ email templates, 24/7 support, API integration, mobile-responsive templates, A/B testing and a robust customer support system. 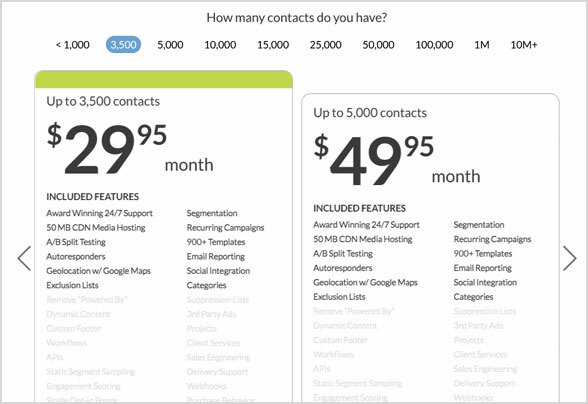 Some of the more advanced features aren’t available until you climb the price tiers, but if you’re a medium to large business with a diverse set of email marketing needs, Campaigner could be exactly what you need. One of the oldest email marketing providers in history, Campaigner was founded in 1999 and was pivotal in defining what email marketing looked like in the early 21st century. It was acquired by Protus in 2008 and acquired again by j2 Global in 2010. j2 Global owns a plethora of businesses in everything from virtual phones to CRM solutions. 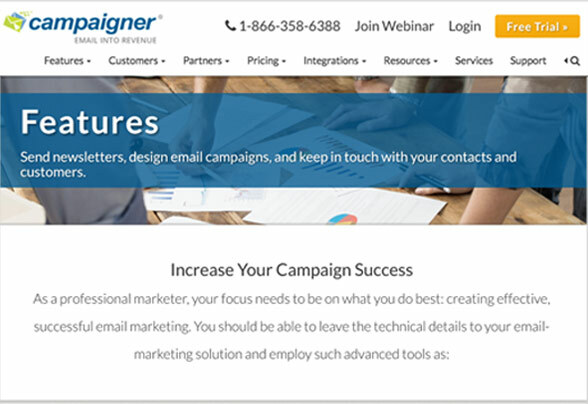 Campaigner strives to provide a comprehensive suite of email marketing features to businesses of all sizes, although it tends to cater to larger businesses.